Carly and Taryn Fleischmann’s parents had the same hopes and dreams of every loving parent when their twin daughters were born. Shortly after their birth those dreams came crashing down: as each day passed they noticed the differences between their two beautiful girls. Taryn reached and surpassed each typical developmental milestone such as crawling and interacting with the environment and individuals around her while Carly seemed to be lost in a world of her own, unable to complete even simplest of tasks and without the means to communicate even the most basic of needs. Finally after what seemed like an eternity of consulting countless numbers of doctors and specialists, the Fleischmanns were devastated to be informed that Carly was severely autistic. The family was told their daughter would probably never talk or advance much past the intellectual abilities of a small child. Despite the odds against them the Flesichmanns sacrificed to pursue a course of aggressive therapy and intervention to help their daughter to achieve all she could. Hopeful, Carly’s parents prayed for the best but also had to accept that life would never be easy, every day a battle against an unseen enemy that held their daughter in its clutches. Then came the miracle. At the age of ten after a full decade of almost no communication with those closest to her, Carly astounded everyone by typing onto a laptop. It was a defining moment in her life—as well as her family’s. She exited her world of silence, truly engaging with those around her. Through hard work and perseverance what was once one word became two and then sentences emerged. Today Carly is an inspiring young woman who offers a glimpse into a life lived with autism as she shares her experiences and thoughts with the entire world through the Internet and social media. Through her remarkable journey Carly Fleischmann has become a national figure as she explores every aspect of what it means to be autistic within her writing. Witty, sarcastic, and heartfelt, Carly’s words shine with personality and intellect, her strength and determination adding sparkle and hope. Coming from a person who once held all her thoughts inside with no outlet, every word from Carly is precious and full of meaning. 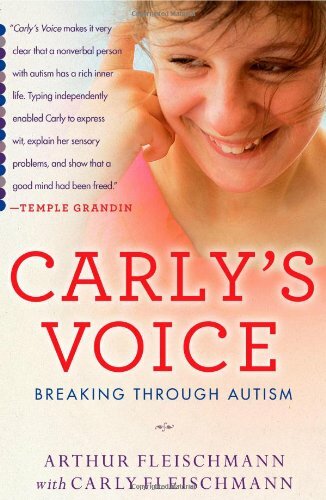 Carly’s Voice offers readers an inside look at the isolating condition known as autism from both a family and personal perspective as father and daughter collaborate to share their experiences. In Carly’s Voice readers are given a truthful and raw look at the everyday lives of families and individuals living with autism on a daily basis. Today Carly attends a mainstream high school—enrolled in gifted classes. Her writing and outreach to the world have made her a unique and powerful advocate for autism.